The Ekornes Stressless Glide System consists of a patented set of adjustments that allow you to adapt a Stressless recliner to your body's height and weight. If you've ever sat in a recliner that doesn't stay reclined or one that won't stay upright, you can appreciate how easy it is to tighten Stressless chair settings to your specifications. Unlike some recliners that you have to tip over to locate the adjustment mechanism, the Stressless recliner adjustment knobs are within easy reach while you sit in the chair. 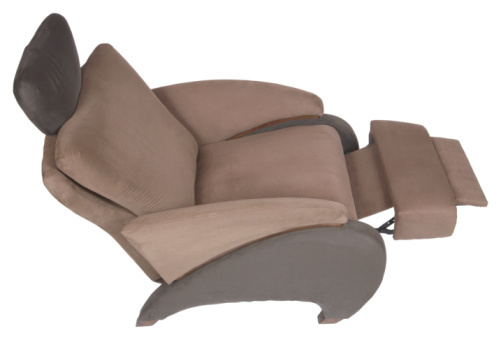 Sit in the Ekornes Stressless chair. Push back with your legs so you can recline in the chair. Reach down on the outer left side of the chair while you remain seated. Locate the Stressless recliner adjustment knob on the glide system. Turn the knob slightly to the rear of the chair, or clockwise if you are looking at it. Turn the knob on the Stressless Glide System on the right side of the chair as well, except turn it slightly toward the front of the chair. This would be clockwise if you were looking at the knob. Push the chair upright with your body. Settle into the reclining position again. If the movement is still too loose, repeat Steps 2 and 3 until the chair performs the way you want it to. How do I Remove the Seat From a Lazy Boy Recliner?